The Czech Defence Ministry will launch a tender for purchase of 210 new tracked infantry fighting vehicles worth 2.58 billion, within a few months, to replace the BMP-2, while continuing the project of Pandur II, thus the army structure based on a „heavy“ and a „light“ brigade. These would be the main competitors. The Czech Army currently operates 185 soviet era BMP-2 (боевая машина пехоты, Infantry fighting vehicle, marked as BVP-2 in Czech for bojové vozidlo pěchoty) tracked infantry fighting vehicles (IFV). Those were produced during the 1980’s in Czechoslovakia under a license, and they were the second generation of the BMP-1 originating in 1960’s (the Czech Army has still nearly 170 of those in reserve). Since 2013 options concerning either a modernization of the BMP-2 or it’s replacement were considered. The vehicles serve with two mechanized battalions of the 7th mechanized brigade, and with several other units. Together with the BMP-2 the Czech Army deploys 107 wheeled armoured personal carriers (APC) Pandur II produced by Steyr-Daimler-Puch (part of General Dynamics - European Land Combat Systems) purchased in 2009. Pandur II serves with two mechanized battalion of the 4th Rapid Deployment Brigade. For now we will leave aside the conceptions of development for the Czech Army, the opinions can differ, the fact is that the Czech Defence Ministry will launch a tender for purchase of 210 new tracked infantry fighting vehicles worth 2.58 billion, within a few months, to replace the BMP-2, while continuing the project of Pandur II, thus the army structure based on a „heavy“ and a „light“ brigade. Several competitors took part at the IDET 2017 exhibition in Brno last year and the Czech Army did trials of four potential replacements for the BMP-2. BVP-2 weights 14,3 tons, is 2,07 m height, it is operated by three crewmen and can transport up to seven soldiers. It is armed with a 30mm 2A42 automatic cannon, 9M113 Konkurs anti-tank guides missiles (ATGM), and a 7,62mm PKT machine gun. Maximum speed reaches 65 km/h on the road, 45 km/h off-road and 7 km/h in water. It is fully amphibious. The Czech Army has not announced a need for any recovery vehicles, light tanks or APC variants based on the new IFV, as it has none based on the current BVP-2. BAE Systems (a British multinational defence, security, and aerospace company) presented an advanced version of it’s CV90 (Combat Vehicle 90), marked as CV9030CZ. The CV90, (operated by Denmark, Estonia, Finland, Netherlands, Norway, Switzerland and Sweden) is manned by a crew of three and can transport up to eight soldiers. The presented version offered a better panoramic sight for the commander, a dual-launcher for the Spike-LR anti-tank guided missiles. It was armed also with a Mk 52 chain gun (7.62 mm NATO), and the 30 mm Bushmaster II cannon by Alliant Techsystems (ATK) with a total of 400 rounds ready or stored inside the vehicle. These are mounted either on a manned turret, or on the unmanned Kongsberg Protector Medium Caliber Turret 30 (MCT-30) for the CV9030CZ r variant. The passive protection consists of AMAP ceramic composite armor by IBD Deisenroth (Germany), and it answers the STANAG 4569 level 6 requirements against kinetic energy ammunition, and STANAG 4569 level 4 against anti-vehicle mines. Two launchers for the Iron Fist Light Configuation hardkill active protection system (APS) have been fitted to the vehicle’s turret, able to engage ATGMs and RPGs with high-explosive blast grenades. The payload capacity of the last versions of CV90 reaches 16 metric tons, and the gross weight 35 tons. Scania diesel engine offers a top speed of 70 km/h on the road. 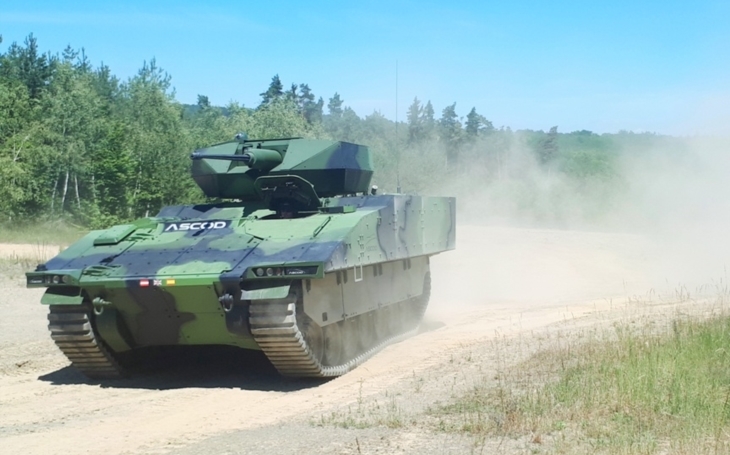 General Dynamics European Land Systems offers the Czech Army it’s latest ASCOD 2 (Austrian Spanish Cooperation Development) infantry fighting vehicle. It is the producer of the Pandur II which already is operated by the Czechs. Previous versions of the ASCOD vehicle are beeing operated by Austria (ASCOD Ulan), Spain (Pizzaro) and United Kingdom (Ajac Scout Special Vehicle, in development). The ASCOD 2 should feature a high level of passive protection, meeting the STANAG 4569 level 6 requirements for ballistic protection and full level 4/4a mine protection. With estimated gross weight of 38 tons and equiped with a MTU 8V 199 TE20 engine the maximum speed of the vehicle should reach 70 km/h on the road. It is larger than the CV90, so it offers greater payload (19 tons). It has crew of 3 and can transport up to 8 soldiers. It is fitted with the Samson Mk 2 remotely controlled weapon station (RWS) mounted with the Bushmaster II cannon (with 200 rounds), a coaxial machine gun and the retractable dual-launcher for the Spike-LR fire and forget ATGM, like the CV90. The vehicle uses the same dual-axis stabilized MiniPOP optics by the Israeli Aerospace Industries company (IAI) as the Pandur II for the Czech Army does. The Czech Army is also offered the Lynx Infantry Fighting Vehicle by Rheinmetall, as a new development of the design used for the Marder IFV, operated by Germany, Chile, Indonesia and Jordan. Lynx itself was unveiled publicly at the Eurosatory defence exhibition in June 2016. The Lynx IFV has a crew of three and can transport up to eight soldiers, depending on the variant. It is fitted with composite armor to achieve protection against medium calibre ammunition and artillery bomblets. Its belly plate can be fitted with an anti-mine plating kit in order to resist mines and IEDs. The shorter Lynx KF31 chassis can support up to 38 metric tons, the stretched KF41 44 metric tons. It is fitted with a manned turret mounted with Mauser MK 30-2/ABM main gun (chambered 30 x 173mm like Bushmaster II) with 200 round stored in the turret. An external container carriers a 5.56mm or a 7.62mm machine gun. It’s dual-launcher for Spike-LR ATGM’s is dampened which allows to store the missiles for a longer time without vibrations, thus decreasing the likelihood of malfunctions. The top speed of the vehicle depends on the chosen engine variant and varies between 65 and 70 km/h on the road. The vehicle being in development, it offers the possibility to modify the design according to user’s need. The turret can be replaced by the unmanned Lance RC variant for example, the ADS hardkill active protection system can be installed, etc. PSM (Projekt System Management GmbH) is a joint venture between Krauss-Maffei Wegmann (KMW) and Rheinmetall and is offering the Puma Infantry Fighting Vehicle to the Czech Army. The Puma was designed to replace the aging Marder IFVs currently in service with the German Army. Replacement began in 2010 and is scheduled for completion by 2020. The Puma is considered to be one of the world's best-protected IFVs, it is a high-tech IFV expected to be expensive (equiped with advanced thermal imager, laser rangefinder, advanced cameras and optics). It is manned by a crew of three and can transport up to six soldiers. The details of the final configurations of armament and protection are not yet known, but prototypes and integration of weapon systems have been recently ordered by the German Army, as the budget was finally approved by the government. A number of other IFV’s vehicles still could make the run against those offered by BAE Systems, General Dynamics, Rheinmetall and PSM. The cheapest option would certainly be to replace the BMP-2 with an upgraded variant. The Czech company Excalibur Army s.r.o. in cooperation with other Czech and Slovakian companies has developed the Šakal IFV, originally known as the BVP-M2 SKCZ and developed mainly for the export market, however video footage shows that it has taken part in various Czech military exercises and apparently was tested by the Czech Ministry of Defence. And there are others. The company Zetor Engineering, a newly founded subsidiary of the Czech tractor manufacturer, has presented first scale models of the new Wolfdog IFV design, that the company plans to offer to the Czech Army. The vehicle is meant to be manned by a crew of three and transport up to eight dismounts. There is the Polish WPB Anders (Wielozadaniowa Platforma Bojowa Anders i.e. Anders Multirole Combat Platform) and the IFV built on it. The detailed conditions of the tender are yet to be reveiled. Experts, like Lumír Němec, mention the need of local Czech production of these vehicles, for obvious logistical reasons. Martin Koller would prefer tracked IFV’s over the wheeled Pandur II, especially for a relatively small Czech Army, and he sees costs of maintenance but also of training of crews as irrational in case of using both the tracked and the weeled vehicles. The upgrade of the Czech Army’s tracked IFV’s is necessary in any case. And bonus: Namer APC for the Czech Army?